Yesterday we went to The Dress and Co Fashion Show. 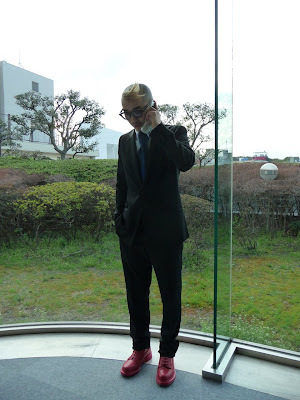 It was held at the Laforet Museum in Harajuku. While we were waiting in line I had my photo taken by a photographer from FashionSnap.com (a Japanese Street Photography site) and the photos should be up in the next month or so. Will keep you posted! 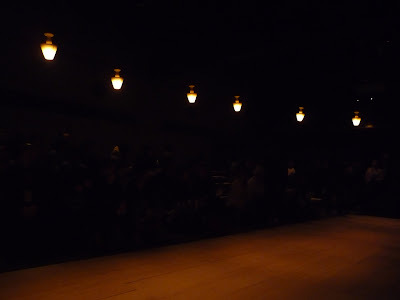 The setting of the show was very moody and when we arrived it was very dark and there were dimly lit lamps lighting the room. When the show began the lights came on and the steam machines started as the models came out onto the runway. I was lucky enough to have a front row seat and actually got some great pictures! 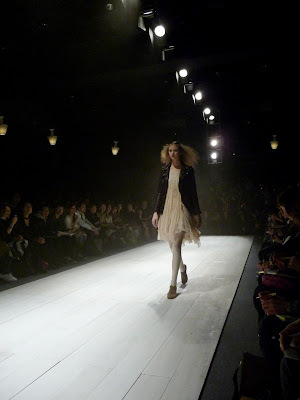 The first few are the ones I took and you can see the Japan Fashion Week runway photos below them. 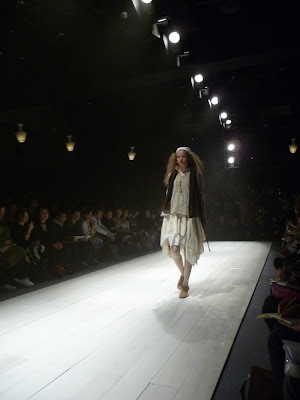 Hideaka Sakaguchi graduated with a degree in interior design from Hosei University. He worked at Designers' Maison and then created his own company, Jelly Garcia in 2002. In 2008 his collection was shown at RENDEZ-VOUS Paris and he has continually been gaining orders from around the world. The label was renamed The Dress and Co. for this year's collection. You can visit his website here. The collection was quite different than anything I have seen lately. The models had extremely teased hair with a single braid in the back and bright red lips. 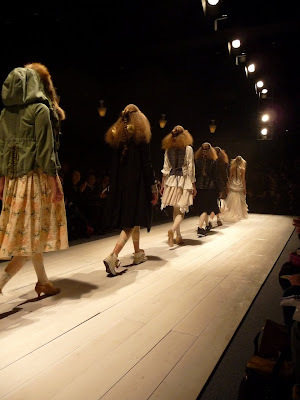 Many of them wore converse sneakers embellished with beautiful flowers. I wasn't too keen on the sneakers but the whole theme seemed to work well. Knee length suede boots were prominent too. The collection was all about layers and varying dress lengths. There were some beautiful dresses that we saw both dressed up and dressed down. 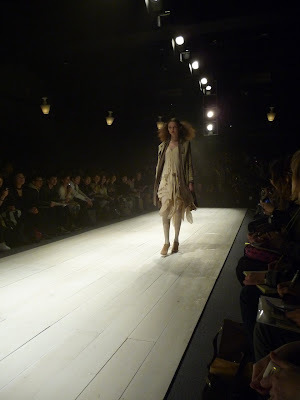 Some great baggy and casual winter coats with fur embellishments went down the runway as well. 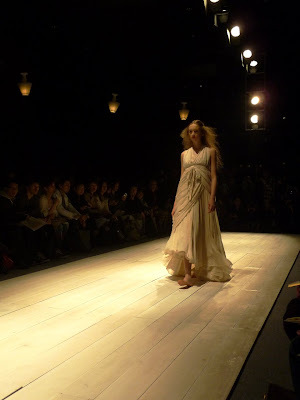 Many of the dresses were made of soft light cremes and whites and featured delicate floral patterns. 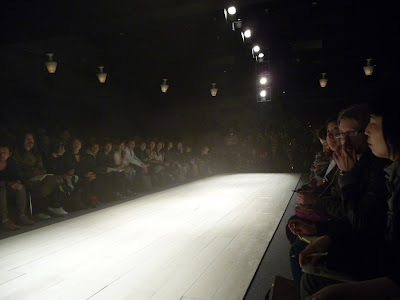 The models seemed to float down the runway as if they were on a foggy lake surface. It was magical! for the show to begin! The scene when we arrived. The setting of the show. This final dress was quite stunning! Two lovely models after the show! The one wearing the hood with fur looks grumpy. 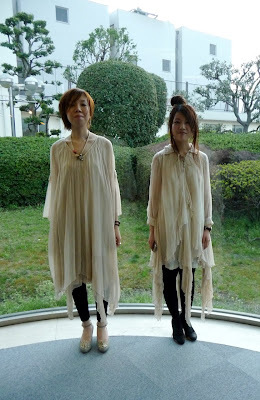 I love the soft neutral tones and the feel of these clothes--they look cosy and chic. Also the models super frizzed hair is great. Actually I take all my own photos--I use a self-timer. I freeze up whenever someone else holds a camera and I like to have creative control of composition and angles. I love these clothes and your beautiful pics. I'm a big fan of neutral tones and flowy fabric. Looks like a great time! Thanks for sharing! 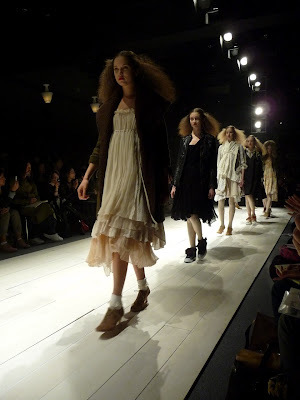 Surprisingly thefashionspot isn't very quick on the uptake with Japan fashion week photos so I look forward to seeing them on your blog every morning these days! I still have another two years of schooling left for my first degree. I'm hoping to be more involved with my internship this summer, because I've been so busy with school all year. I'm anxious to get some real-world work experience, even if it isn't paid, because school so far is just theory. How are things in Japan? Are you working there?